The Koguryo Kingdom was stretched from the upper Korean Peninsula into what is now China between 37 B.C. and 668 A.D.The kingdom’s tombs and murals in China and North Korea were listed as UNESCO World Heritage sites .The Kingdom is believed to be the longest regime founded by an ethnic minority people in northeast China and it played a big role in the development of Northeast Asia. 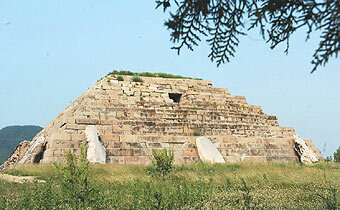 The site includes archaeological remains of three cities and 40 tombs: Wunu Mountain City, Guonei City and Wandu Mountain City, 14 tombs are imperial, 26 of nobles. The walls and ceilings of the tomb-chambers in many Koguryo tombs were decorated with colorful paintings and the floors were paved with tile-bricks carved with Buddhist images such as lotus flowers or grotesque animal faces .